Offer only available to players aged 18 or over. Offer only available to new players, unless otherwise specified. No deposit required redeeming the Bonus amount. 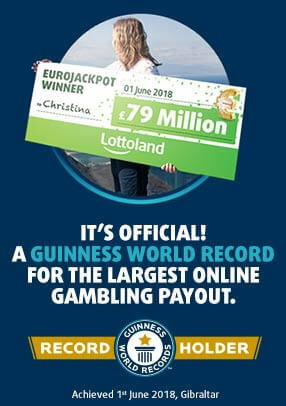 Player must register at Lottoland.co.uk and complete their details prior to confirmation of their Free Line Ticket. Bonus amount is the equivalent cost of a Single Line entry for Mega 2016 at Lottoland.co.uk, unless otherwise specified. Bonus amount cannot be withdrawn prior to bet placement. Bonus only applies to the first purchase.